Based in San Francisco, Kathryn Clark works with the traditional textile mediums of embroidery and quilting to document global societal issues. Born and raised in the Deep South, a move to San Francisco in the 90's posed a start contrast to her upbringing, informing her current work. A passion for the social benefits of urban planning and a fascination with maps led her to work for Peter Calthorpe, a visionary in the field of urban planning. She left the planning field in 2004 and shifted her passion of geography and mapping into her artwork. 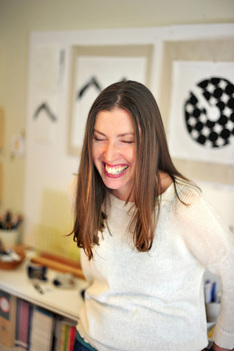 In the past six years, her work has been widely exhibited across the U.S. and has been featured in several publications including The Craft Companion, 2016, Quilts and Human Rights, 2016 and Craft for the Modern World: The Renwick Gallery Collection, 2015 as well as American Craft Magazine, Planning Magazine, Uppercase and New American Paintings. Her work is in permanent collections at the Smithsonian American Art Museum, the International Quilt Study Center & Museum, the ACLU and Michigan State University Museum. Kathryn Clark’s recent work explores global issues ranging from the US foreclosure crisis to international border controls. Inspired by the pattern and scale of human manipulation on the planet, her work questions the long-range implications this has on our environment, society and economics. She relays these stories onto cloth, creating a historical document of our times. Presenting these subjects through the use of traditional textiles offers a viewer a more approachable relationship with narratives that we often choose to conveniently ignore. What at first seems beautiful, upon further investigation reveals a darker tale.